Ruckel's Restaurant: Ruckel's Welcome's Springtime! Our Pay Lake will be open extended hours on the weekends (7:00 am - Midnight) so you can feel free to stay out late! We will also be offering special deals on ice cream, milkshakes, and desserts throughout Spring Break. We will be featuring a "Flavor of the Day" and all items that flavor will only be $1.00! We are open to suggestions as to what other special deals we should offer. Just let your waitress know and we will try to make it happen! FISHING TOURNAMENT!! Mark your calenders! We are so excited and are looking forward to a new, fresh tournament style.It will still be an all night tournament, but we have some amazing deals in the makings for you! We will keep you posted on the mini prizes, cash jackpot, and the rules & regulations! Keep in contact with us! 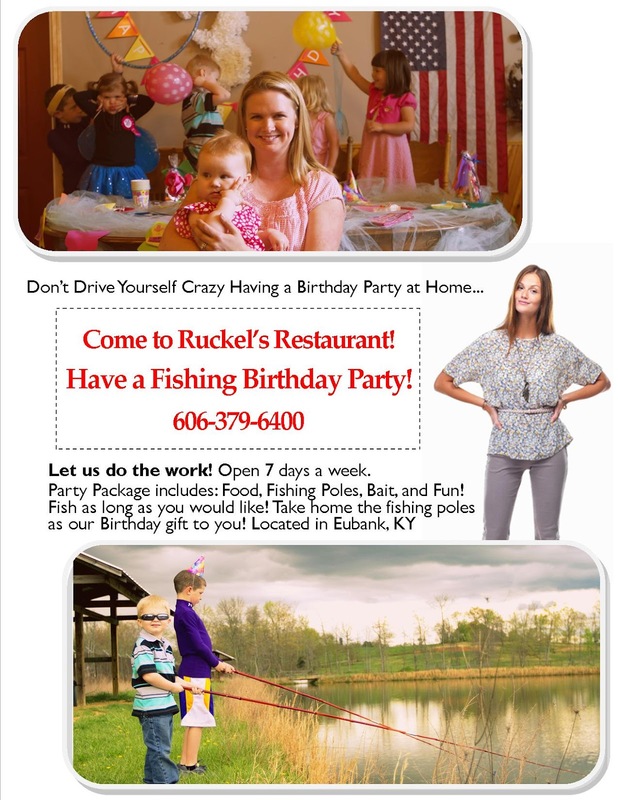 Check us out on Facebook as Ruckel's Restaurant and on Twitter as @Eat_At_Ruckels for updates, deals and more! We have now begun our unique, stress free birthday parties! For more information click here Birthday Parties! 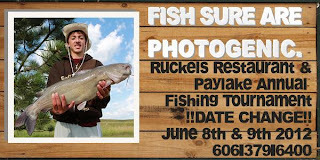 What's going on at Ruckel's Restaurant? We have just welcomed a brand new chef to our staff. We believe that Ashley will be able to WOW you with her cooking! Let us know what you think of her! The 7th grandchild of our owner, Darlene Litteral, and the 10th Great Grandchild of our Founders and owners, Lloyd and Donna Ruckel, was recently brought into the world! His name is Brody Chandler Roberts and he is Beautiful!! One of our chefs, Michelle Robinson, is getting ready to have her second baby!! We are counting down the days. There are brand new babies all over! We have some amazing customers come and dine with us! We are looking forward to the new customers the summer brings, and we always enjoy seeing the friendly faces of our faithful customers. We have created a survey for you to fill out to tell us about your experience and to help us improve on our food and service we provide to you! We are taking reservations for Easter Dinner. No reservation is needed, as always, but if you are planning on bringing a larger party let us know ahead of time and we will have your table set and ready for you!